I’ve been on a mission to organize and remove clutter from my home for about five years and it continues to be a work in progress. Every room has unique organizational challenges. In the bathroom, I have an assortment of jewelry, hair pins, cosmetics and other woman stuff cluttering the vanity, (The man stuff consists of a can of shaving cream and razor.) Things I use frequently were tucked inconveniently in a drawer. Since there is a decent amount of space on the sink top, especially when all those girly things are put away, I decided I could spare a little space for a nice glass container to hold cotton swabs, which were hidden away in a drawer. 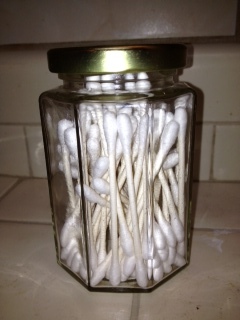 This container had two jobs to do – organize my Q-tips and look pretty. I checked out the bath section at two of my favorite discount stores. All the glass containers looked pretty similar and the cheapest ones were $6, which is not a lot of money but then again, this project is small and kind of frivolous. In the interests of saving money, I left the stores empty-handed. 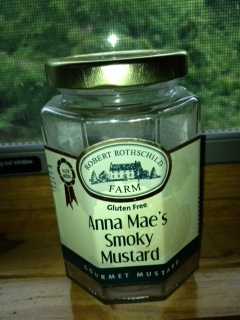 As I washed dishes and cleared off the kitchen counter, I noticed the nearly empty jar of Anna Mae’s Smoky Mustard from Robert Rothschild Farm. It brought back delicious memories of potato salad, sandwiches and pretzels dressed up with this spicy condiment What a pretty container, I thought as I examined the octagonal-shaped jar. Can this jar be repurposed? Hey, it’s just the right size for cotton swabs. I washed it very carefully by hand, then again in the dishwasher. Removing the label, especially the glue, took the most time. The yummy memories remain but the smell of mustard had to go. I let the jar air dry with the lid off to allow time for all traces of mustard aroma to fade. Now the pretty jar has a new life and location in my bathroom. Ah, I feel so clever!